Want to have your loop amplifier next on your end table, but your TV is clear on the other side of the room? No problem, add a wireless transmitter and receiver system. 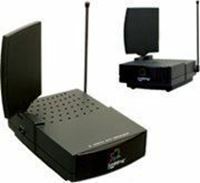 150 foot range wireless audio transmitter allows you to send audio signals from your TV, CD player, DVD player, and more to your loop amplifier. Just plug the transmitter into the device you wish to hear (TV, DVD, or CD Player) and plug the receiver into your loop amplifier. Now you have the sound you want without the mess.